Hi readers! Sorry I missed my video update yesterday; late nights at the office don't do well for blogging on time! Since I can't get you a video right now, how about a review of a project that has pretty decent photos, anyway? How about something that uses yarn really quickly? How about something that isn't knitting? How about this scarf that I made? I'm new to weaving-- this summer was my first attempt at weaving. I wasn't particularly interested in learning how to weave until I saw some really cool pooled Wollmeise scarves in the Wollmeiseaholics group on Ravelry. 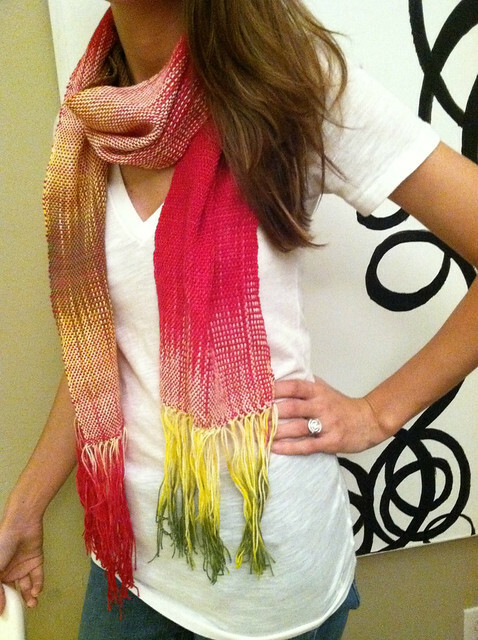 Some of the colors, like the pitahaya I used for the above scarf, look a little crazy when knitted into a fabric. I find the irregular striping to be super loud and distracting on me, so this is a great way to use supermultis in a more controlled way. You can actually pool with knitting, too, but I haven't tried it yet. So the thing about pitahaya is that it's lovely: pink, green, and white. 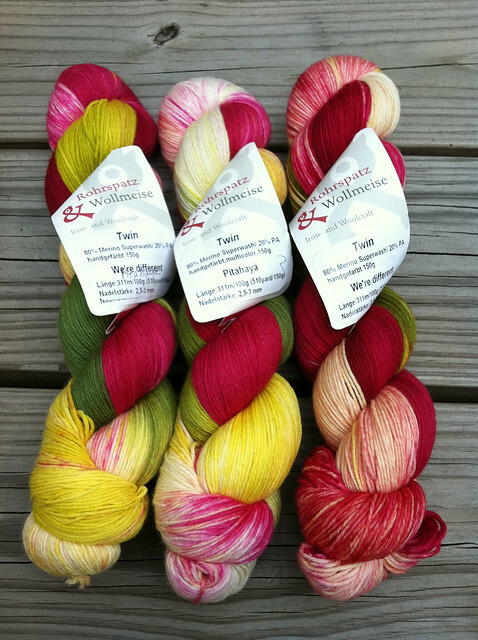 The skeins are SO pretty. 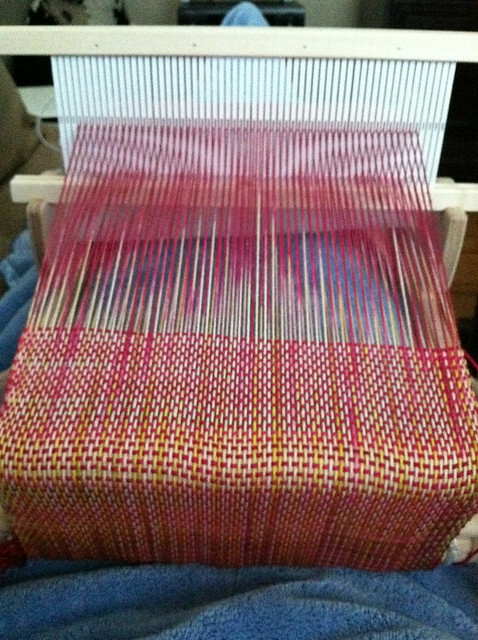 From there, I wound the warp threads around the apron bar, got everything ready, and started weaving in my weft yarn. 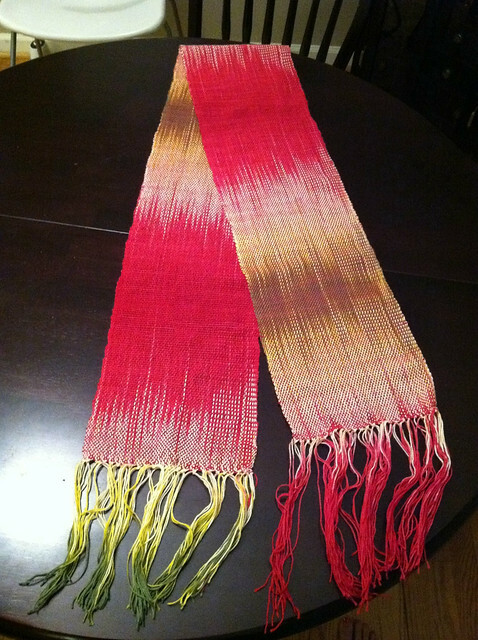 For this scarf, my weft yarn was the same color pink as the pitahaya, but just solid. If I had a white, I would've used it. You can see all the color repeats here, really well. I ended up doing a triple knotted fringe on the ends, which gave it a decent finish for this newb. For simple weaving projects, I really like my little Cricket. It's portable, easy to store, and makes good presents that don't require the commitment of knitting. On the other hand, your finished product is basically 10" to 12" wide, with an infinite length. 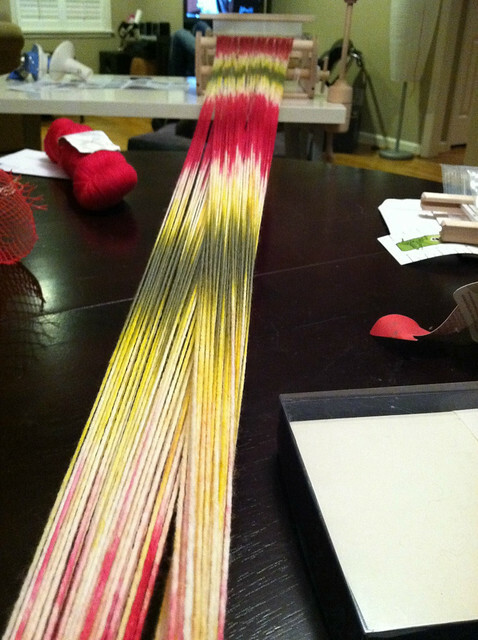 More complex weaving, or wider objects, have to be done on another type of loom. While I DO enjoy weaving, knitting's still number one for me. Lovely! And I am sure it is so soft...love Wollmeis!